Whether you’re moving, trying to decide whether you should move or stay in your current space, or consolidating personnel from multiple offices into a single location, our expertise in relocations can help you evaluate and compare alternative locations – and even explore the possibilities you may not have thought about in your current space. We develop “test fits” that let you assess the pros and cons of your options, and determine which space is best aligned with your objectives. 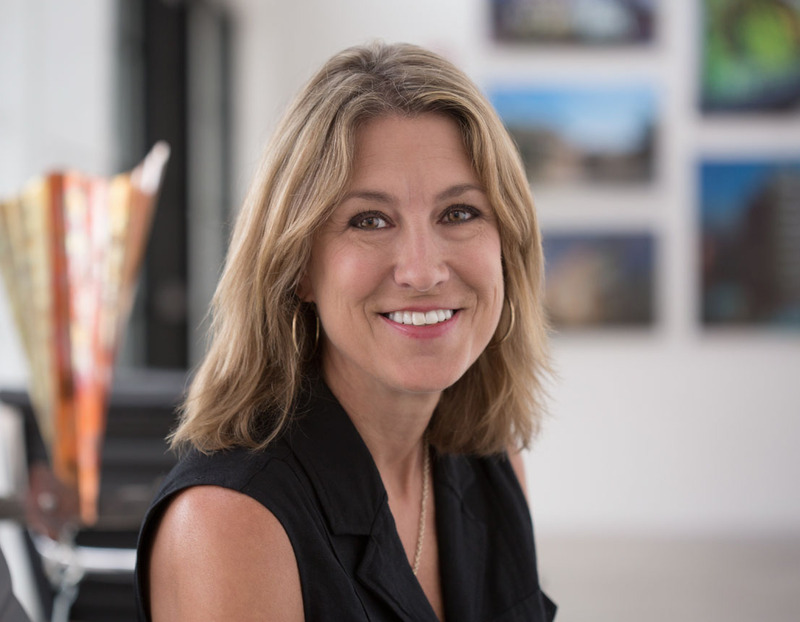 Under the guidance of Director of Interiors, Donna Dowling NCIDQ, we’ve completed programming, space planning, and interior design for more than 10 million square feet of office space. The decision to remain in your current location, to move, or to consolidate personnel from multiple offices into a single location impacts your entire business. Our expertise in relocations can help you evaluate and compare alternative locations – and even explore the possibilities you may not have thought about in your current space. 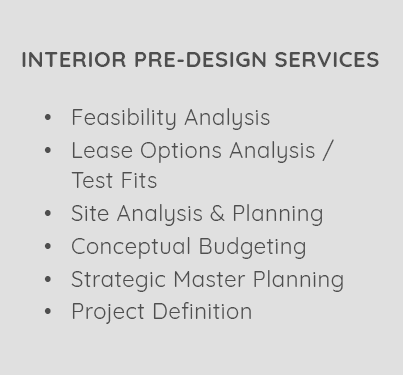 We develop “test fits” that let you assess the pros and cons of your options, and determine which space is best aligned with your objectives. The first thing we do is engage with your stakeholders to create options and opportunities for discussion, refine and revise them to build consensus, and then provide the basis for an interior environment that is uniquely tailored to your mission and desired image while optimizing the way you work and the resources you have to work with. Visioning is an immersion into your organization, operations, and culture. It will help you understand where you are, forecast where you want to be, and understand how to express and support your mission and vision through design image. 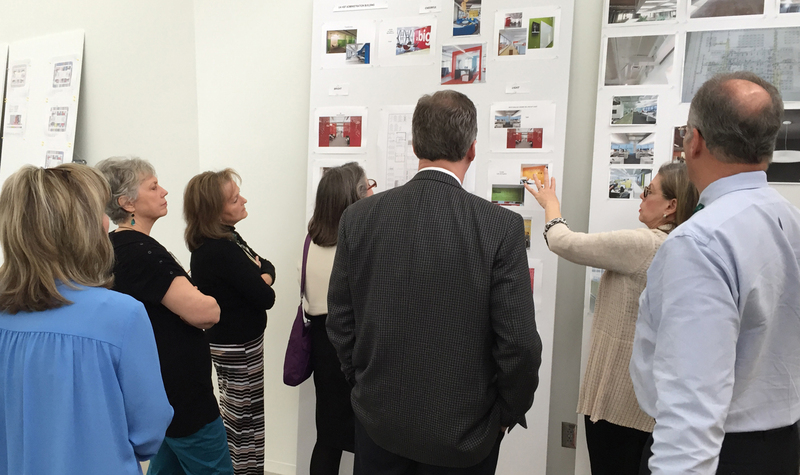 This takes place during a workshop that we call a “charrette.” Our designers will lead a group of stakeholders, defined by you, in a series of exercises that explore and articulate your culture, your image, and your vision – and how those qualities are expressed in physical space. It will help you understand the correlation between physical space, perception, and behavior. 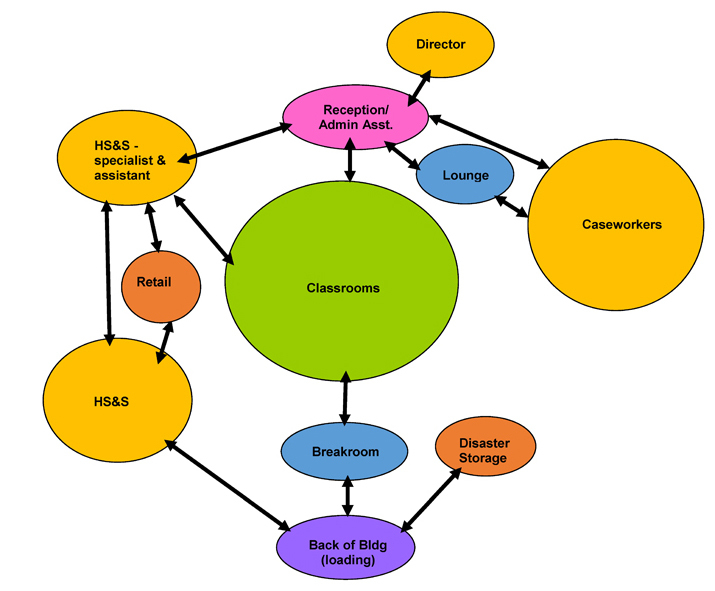 We balance this against an exploration of pragmatic concerns like workflow analysis and functional adjacencies, staffing, business goals and objectives, and budget. By understanding how these elements work together, we can help you define the desirable – and undesirable – qualities of your ideal physical space. The Programming process brings everyone to consensus around a shared Project Vision in which all feel ownership. 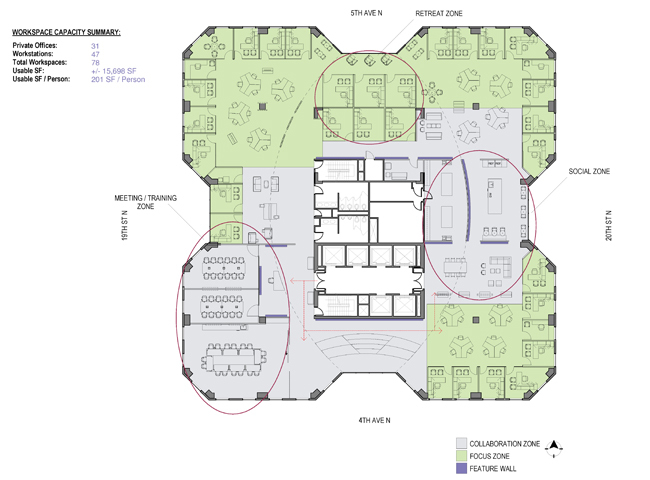 This collaborative process results in a “roadmap” that will guide you to the optimal space. Building on the Visioning charrette, we “walk in your shoes” – visiting your current offices and getting to know you as an organization. Together with you, our designers further analyze your current workflow to understand what works and what doesn’t. Then, by analyzing your people and functions, we together develop and define workplace standards and space allocations, blending your preferences and industry best practices. We extract pragmatic concerns like growth projections for personnel and space, functional adjacencies, and organizational goals and objectives; all balanced against the budget. These are woven together in a final document that is an objective tool that will be used as the foundation for test fitting and subsequent design. VISIONING provides a qualitative context that overlays the PROGRAM – the quantitative data that defines your organization’s physical and operational needs. 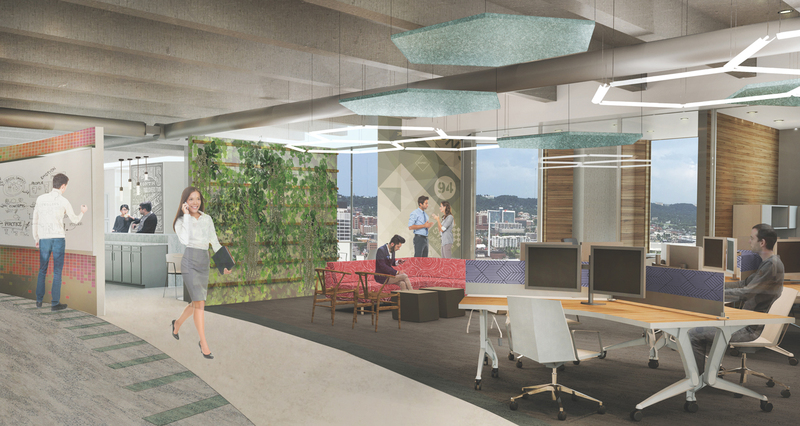 While a PROGRAM results in a clear understanding of the spatial requirements that will allow you to function optimally now and into the future, VISIONING helps you define the qualitative aspects of the space you seek and understand their impact on your image and culture.